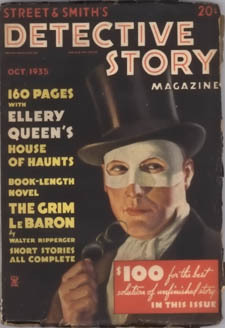 The House of Haunts, a novella, was originally published in Street & Smiths Detective Story Magazine in October, 1935. The name changed to The Lamp of God when it was included in The New Adventures of Ellery Queen (1940). It was also published on its own in 1950. The story is a fun little romp. A lawyer friend desperately contacts Ellery, needing him to meet a ship at the New York docks, in order to meet a young woman from England, arriving to collect an inheritance from her estranged father. They accompany her to the family estate, marked by two houses, the Victorian “Black House,” and the newer “White House.” They meet the eccentrics of the family, and upon waking the next morning find the Black House has disappeared. Of course, that was where the family fortune was supposedly hidden. Clues are unearthed, culprits apprehended. As an aside, we do learn something of Ellery Queen’s culinary tastes. “…if there was one dish he detested, it was lamb; and if there was one culinary style that sickened him, it was curry.” The story is, of course, the Lamp. not the Lamb, of God. Anyway, here is a nice recipe for curried lamb. At the heart of the solution is the question of recognition. One character is introduced, and when she is next seen, she has a huskier voice caused, she claims, by an oncoming cold. Seems normal. Why doubt that? When we meet someone, we get to know them in that moment: their hair, their clothes, their voice, their basic features. When we see them again, we have to adjust our memory of them: their hair may be different, their clothes have changed, their voice could be slightly altered for a number of reasons, and their features could look slightly different based on the lighting and the angle we are looking at them from. The context in which we see them may also require a software upgrade. But this is normal. We can expect it. So, how easy would it be for a similar looking doppelganger to slip into their person, to pass as someone else? Would our brains process the second person as just a slightly newer version of the first person? Would we just accept the huskier voice as an oncoming cold? How can we trust our senses, our brains, especially when houses can apparently disappear over night? This would also make a neat period-piece film. I can hear and see Alexis Denisof saying the lines.